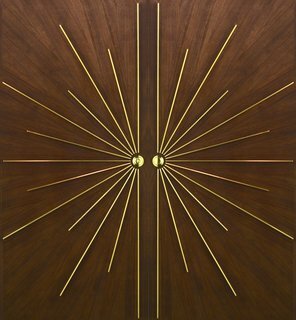 I never imagined that trying to find architectural doors for our mid century modern home would lead my husband and I on a three year quest that ended with us designing our own line of custom crafted doors. For the past decade we have run a business restoring mid century modern designs. It's a passion for both of us, so when we finally found the perfect mid century modern home overlooking the city we already had all the perfect furniture to fill it. The challenge was going to be restoring some of the original fixtures that previous owners had, sadly, changed over the years in a series of not so great updates. Outdoor lighting was a breeze. 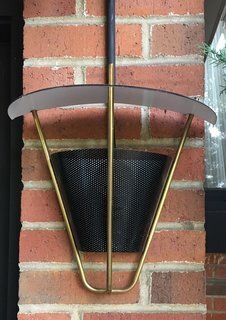 Lightolier wall scones and outdoor pole lamps by Gerald Thurston were perfect. Restoring the old ceiling beams took elbow grease. I got a roll of amazing vintage Knoll wall fabric to use in our dining room. I found the perfect vintage tiles for the bathroom along with NIB fixtures from the early 1960's. All that was left was to find suitable doors. We needed a great front door, a side entrance door and maybe an interior door to use in the red oak paneled hallway. I started looking...and looking and looking. I can be a patient person. I'm used to searching for months or even a year or two to source designs, but after a full year of nothing even in the ballpark I was beginning to realize what I was looking for just wasn't out there. The ubiquitous stile and rail door. It seemed every door I found was a plain square with rectangular panels. 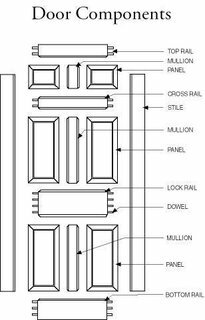 I was soon to discover this was called the "Stile and Rail" door - it's ubiqitous and boring. The only options seemed to be to either paint a common door a bright color and/or add a interesting knob or pull. I was bemoaning the lack of options when my husband said the magic words, "Why don't we just make some doors ourselves?" We own a professional studio and workshop. 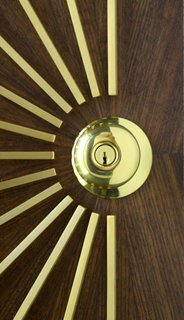 We have master carpenters with decades of experience in our workshop. Surely, we can make a few doors for our home in a workshop that is capable of creating almost anything. Doors seemed simple, they aren't we were just very naive. We were soon to discover why stile and rail doors were everywhere and interesting designs were not...and then try to create our designs anyway.